Graphic design Solutions: Browse the LW design leaflet portfolio below to find out more about each project. 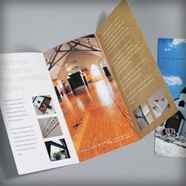 Leaflets are one of the cheapest forms of direct marketing. 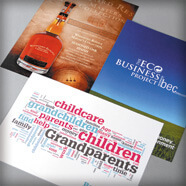 Leaflets are so versatile, it’s no surprise so many of our customers find them an essential part of their marketing. Whether they’re being popped through letter boxes, inserted into newspapers, posted out or propped up on the counter –leaflets look great in glorious full colour and are incredibly low cost. Folded leaflets make great mini brochures. Imagine the world before some clever Henry invented folding. Imagine the size of linen cupboard you’d need to fit your duvet cover in? Well, if you’ve got more to say than you can fit on a leaflet, get a bigger leaflet and fold it. Makes sense really. They’re easier to handle, cheaper than a booklet and cheaper to mail out (if you follow Royal Mail’s guidelines).